Helps eliminate water ponding by allowing water to run freely down the roof through the large fluted channels and off the house. The fluted design also allows air to circulate under the roof tiles which helps keep the underlayment dry. They are not porous as wood is so it won't absorb moisture. They are shipped in handy, easy to handle, two square bundles. BattenUP battens are light, tough and easy to handle. 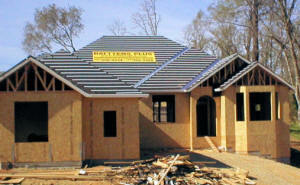 When it's all said and done, using BattenUP plastic, fluted battens is the best choice. It will add additional value and safety to your home.